Following the success of the double Audie award-winning Rudyard Kipling's The Jungle Book: The Mowgli Stories, Audible Originals UK are excited to announce this reimagination of Sewell's unique concept as an animal-based audio drama for all the family. Black Beauty features lead performances from Samuel West (BAFTA nominated; Mr Selfridge, Howards End), Samantha Bond (SAG nominated; Downton Abbey, James Bond), Paul Thornley (Harry Potter & the Cursed Child, Les Misérables) and Tamzin Outhwaite (EastEnders, Great Expectations, Foyle's War) as well as the original theme music 'Galloping Home' by Denis King. I watched the reruns of the Black Beauty television show as a kid in the 80’s and loved it, but I had never read the original book. This was an amazing story adaptation that was extremely well done! I now have a favorite book!!! Really ally loved this radio drama... The book is really brought to life in thia stunning pw performance. Would you consider the audio edition of Black Beauty to be better than the print version? Yes, because of the voices. Black Beauty because I could hear the emotions in his voice of kindness, exhaustion, happiness and sometimes disgust at the ignorance of people and lack of thought for an animal. I also loved Ginger. Her voice showed so much emotion too. I have not listened to any of the narrator's prior performances. I am new to Audible. It brought me to tears several times when life became hard for the horses. I love horses and own one. I hate when they are mistreated. 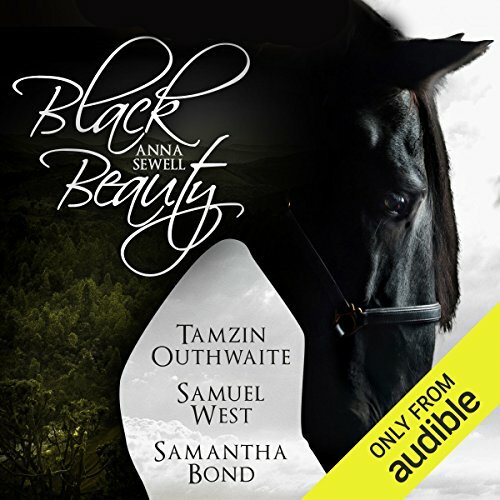 I read Black Beauty as a child, but would recommend this audio book to anyone. It also teaches a lot. I have listen to this audio 3x within the first week and now the forth time. It is beautifully written, engaging and speaks to the heart of humans and their often cruel & lack of compassion towards animals. The entire time, it allowed me draw comparison to the harsh treatment slaves endured. I love this book immensely, it inspired me to listen to more books regarding animals and their unique bonds with humans such as Where the Red Fern Grows. . .
beautiful story like how I remembered from when I was a child. great cast and wonderful sound effects. What made the experience of listening to Black Beauty the most enjoyable? Sensitive adaptation; excellent cast; beautiful narration! What was one of the most memorable moments of Black Beauty? Sensitivity; kindness; beauty and power. It made me laugh and cry. I loved it. A beautiful, sensitive and awesome performance of this timeless classic. Well done. As I hadn’t read Black Beauty I was under the impression it was a whimsical horse story for girls - a equine equivalent of Lassie the Wonder Dog. It isn’t. Written in 1877 it chronicles the life of Black Beauty and is told by the horse itself. A theme of animal welfare and human kindness runs throughout the life of Black Beauty, though on a few occasions it did sound a little preachy. The only other minor criticism is that as I know what Tamzin Outhwaite looks like, when Ginger spoke an image of Ms Outhwaite was speaking in my head rather than a horse. Samuel West portrays Black Beauty wonderfully. An enjoyable listen and am glad to have used a credit for it. A big thanks to Audible, please keep producing audio dramas as they are really appreciated! It was so great to listen to Black Beauty. I couldn't make up my mind if I should buy the audiobook or not. I like audiobooks very much but I was never much into horse stories and I was not familiar with the story of Black Beauty. I am glad I bought It. The speakers and the production is excellent. It is about animal cruelty and the importance of kindness. I also learned a lot about the care of horses, which I found to my surprise interesting. I think Black Beauty can be listened to by children and adults. A very enjoyable book I, was surprised how good it was, a lot of action in this story. So glad I downloaded it, would highly recommend it., it's not just for the young one's , older one's too. Not keen on the human ‘horse’ at all. No real need for a person to stand neighing...! Superb book, beautifully narrated ! Love it, enjoyed it thoroughly ... love the book from start to finish. I have read Black Beauty before but I enjoyed this Adaptation of this book. It was nice to hear from the horses point of view. I hadn't realised that Bath was one of the distinations In the book. Usually I would always choose an unabridged version but this was the right length for us. We liked the play format and the story interested both my 11 year old son as well as my 7 year old daughter. A nice adaption.